The Cincinnati Reds have been a little more active than usual at this year’s MLB Winter Meetings. On Wednesday, they pulled the trigger on a notable trade, acquiring starting pitcher Tanner Roark from the Washington Nationals. In exchange, Washington has received pitching prospect Tanner Rainey. The 32-year old Roark has been a stalwart in Washington’s rotation going back to the 2014 season, save for a bullpen stint in 2015. He’s made at least 30 starts for the Nationals in four of the last five seasons, albeit with varying levels of success. He was at his best in both 2014 and 2016, winning at least 15 games in both seasons while posting a sub-3 ERA. However, he’s come back to earth the past couple of seasons, pitching more like a back-end starter. In 2018, Roark went 9-15 with a 4.34 ERA. While he’s still a serviceable starter, his presence in Washington’s rotation was no longer a necessity after the club signed Patrick Corbin last week. 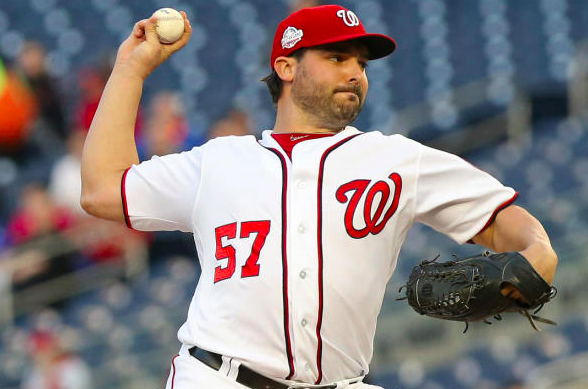 With Corbin, Max Scherzer, and Stephen Strasburg leading the rotation, the Nats didn’t need Roark, especially since he’s expected to make close to $10 million in his final year in arbitration. In that sense, it’s not surprising to see the Nationals trade him. Washington will now look to Joe Ross, Erick Fedde, and some of their prospects to fill out their rotation behind Corbin, Scherzer, and Strasburg. As for the Reds, they have spent the early part of the offseason pursuing rotation help. Cincinnati’s roster is filled with young and largely unproven starters, as well as pitchers like Anthony DeSclafani who have struggled to stay healthy in recent years. Roark may be a mid-rotation starter at best, but health has never been an issue with him. He’s a safe bet to give the Reds 30 starts in 2019, which should make him worth the money he’ll make in arbitration. The only caveat with Roark is that he has just one year left before free agency. Cincinnati will only have his services for 2019 before he hits the open market. However, the Reds are hoping by then that some of their young starters will have established themselves as reliable big league pitchers. In the meantime, Roark will give their rotation some much-needed stability as they make an effort to compete in 2019. In addition to saving some money on Roark’s contract, the Nats also acquire Rainey in the trade. Rainey was Cincinnati’s 23rd best prospect, according to MLB.com. He made eight relief appearances for the Reds in 2018 but gave up an atrocious 19 runs in seven innings of work. However, his ceiling remains high with a fastball that can hit triple digits and a plus slider. If he can improve his control, he could become a late-game reliever, perhaps even a closer. He may also contribute out of Washington’s bullpen in 2019. Obviously, this isn’t a blockbuster trade, but it should serve both teams well. The Nationals didn’t need Roark in 2019, especially at a cost of nearly $10 million. The Reds, of course, will overpay for him a little financially, but they desperately need a pitcher of his consistency in their rotation. In that sense, Roark figures to serve the Reds well in 2019.